Robbie Amell wears black high top Converse “Chuck Taylor” All Stars in the series. 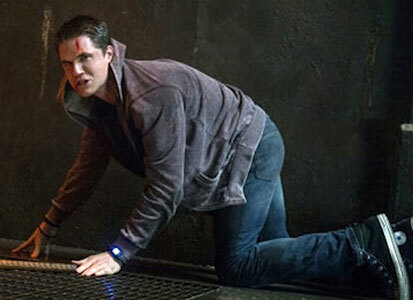 Stephen descends into the unused subway track, the haven of the Tomorrow People. Of all the new TV shows popping up on CW, of all the supernatural, fast-paced shows chocked full of young characters fighting odds and saving the world, The Tomorrow People is arguably the most breathtaking and riveting of them all. The show takes place in a realm where the world as we know it is changing rather rapidly, and focuses on the life of Stephen Jameson (Robbie Amell), a teenager who gets swept up in the supernatural realm around him. When the show begins, Stephen is struggling with his budding powers. He is unable to control them, having no idea that they are even something to be reckoned with, and finds himself succumbing to strange habits such as hearing voices in his head and waking up in places that are not his bed. Stephen and Cara flee into the streets of New York City. Right before he completely unravels, Stephen is confronted by two Tomorrow People, Cara and Russell. They introduce him to the secret network of supernatural beings who are more than human but only desire to live in peace. He learns that his father was the leader of these people, and with the support of his friends and family, he too can harness his powers and lead the Tomorrow People. With many obstacles, both internal and external, Stephen and his friends battle not only to sustain their existence but to create a world in which Tomorrow People and humans can co-exist happily. Stephen struggles to harness his powers. Stephen, beyond just his dashing appearance, is a remarkable and compassionate young man, who cares most about protecting his friends and family. In the beginning of the show, he is soft spoken and well mannered, remaining rather introverted, as he believes his world falls apart around him. His belief that he is going insane causes him to lash out at times, and when his temper gets the best of him he can be very dangerous, even before he has full control of his powers. However, he is mostly caring and forgiving, remaining loyal to the Tomorrow People and especially to Cara, with whom he shares a strong, telepathic connection. Cara and Russell work against time to save Stephen. Stephen is more than your average teenager imbued with supernatural powers; his humble, often flawed personality, his willingness to accept when he makes a mistake, these qualities render him relatable and sympathetic. Furthermore, his casual, low-key attire, from his hoodies to his black chucks with their colorful laces, makes him recognizable as a regular teenager who just wants to fit in and help his friends. The show does a wonderful job balancing the supernatural and human stresses of a teenager living in a world on the brink of paranormal chaos, while providing rich character relations that every viewer can relate to. Cara prepares to save Stephen.